There have not been too many salmon fishing reports around Sooke this week. From the sounds of things, Sooke's salmon fishing is a bit slow. Quite a few reports of halibut caught from Sooke to Victoria though. With the recent Feb 1 opening, anglers seems excited to chase these tasty flat fish. The photo to the right is from "Striper Jack", out for his first trip this year and got the lucky day he was due -- picked up three halibut at East Constance Bank. He was fishing in 170-195 feet depths and caught halibut weighing 18, 19.5, and 24.5 pounds. He says "I took the picture with small guys to help make the fish look bigger". 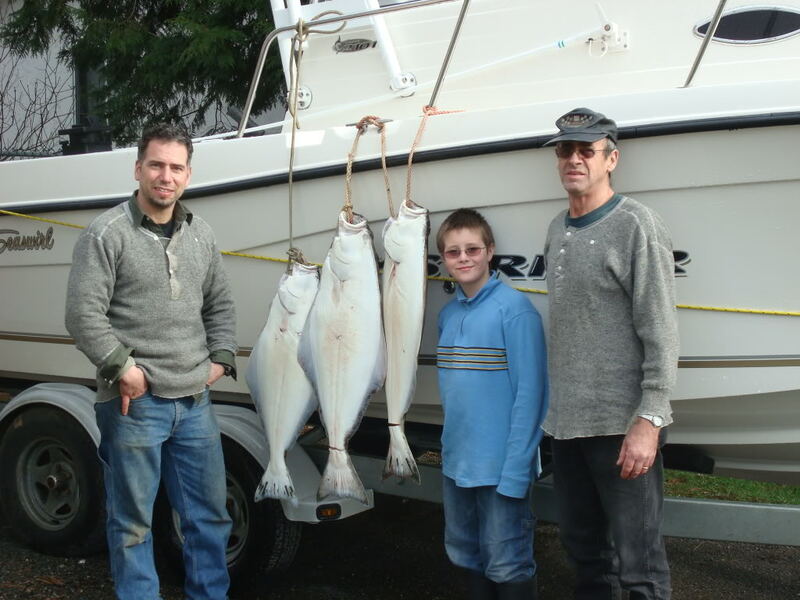 Trevor from No Bananas Fishing Charters reports two excellent days of February halibut fishing off Albert Head. The first day, they landed 5 fish and lost a couple of others, with the halibut 20-35lbs. The second day they fished for 4 hours and landed 8 halibut, as well as losing a couple. Lots of dogfish to wade through, but the halibut were there. Lots of action...in 270 foot depth, using mackerel bait, salmon bellies, and mudracker jigs. Beautiful sunny weather and calm seas so far this week....get out there and try your luck!